As I perused the reading for today in Exodus, I was struck by the differences in how the ten commandments were presented. A commandment as powerful as “You shall not kill” is presented using a whopping four words. Yet with a quick skim of the page, it is clear that significant focus has been placed upon the importance of keeping the Sabbath holy. Nearly as many words were used in order to explain “Why?” and “How?” regarding resting on the seventh day as there were for the presentation of the other nine commandments combined. Clearly this was a commandment that was meant to be fully understood. Despite the care taken to educate us about keeping our seventh day restful and holy, it is oftentimes one of the easiest commandments to overlook. Myriad household chores, social events, grocery runs, rehearsals, and scrimmages spill over from weekdays and Saturday into our beloved Sabbath. After all, if we can’t follow all of the commandments, this is probably a decent one to break, right? I can recall facing a similar struggle as a new volunteer at my first project in southern Colorado. My house was next door to the homeless shelter where I spent part of my workweek which made it easy to stop in and lend a hand when I had a free moment. It was sometimes too easy. I would find myself jumping right back into work on my days off and feeling burned out at various times during my scheduled hours. Thankfully, a friend noticed and called me out. She suggested that, if I felt drawn to spend time in the shelter on my days off, that was fine. But instead of being at work, perhaps I should simply try being present. I needed the reprieve from being “on” all the time. She was right. 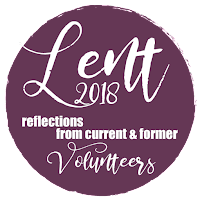 What a gift it was to allow myself to have time to see this space for people in need as not simply a list of chores and meetings to be completed, but a gathering place for the battered, the broken, and yearning – the neighbors I never really knew. Those weekend days when I crossed the threshold of the shelter, I entered as a part of the community that I hadn’t recognized already surrounded me. As a friend with no agenda, stories and smiles poured forth from these people, strangers no more. Creator of heaven and earth, thank you for the gift of rest. In a world that begs for our time and attention, may we be ever aware of our call to care for ourselves and others by stepping away from the hustle and bustle and simply re energizing through basic human connections. Give us the strength to rest, just as you have called us to do, and allow us to embrace the still, small voice within us that rejoices in our varied ways we experience the holiness of our Sabbath day. Take some time on your Sabbath to be with someone you do not normally encounter casually. Visit a nursing home, Skype your college roommate, FaceTime your niece, or strike up conversation with those whose eyes beg for someone to hear their story. There is always someone out there who has a story to tell or would like someone to simply listen and remind them that their voice is being heard in this cacophonous world. Ben Bear is a native of Nokesville, Va., and has served at Brethren Volunteer Service placements in Colorado, Ohio, Oregon, and Illinois. He is passionate about sustainability, community, and desserts, though not necessarily in that order. Ben currently works as an Adult Protective Services social worker in Harrisonburg, Va.